A Comprehensive Look at Essential Considerations for the best corded reciprocating saw: A reciprocating saw is designed to offer help when it comes to creating rough cuts for demolition and in building materials. The saw’s motor sends immense power to the blade, allowing you to effortlessly cut through a broad array of materials like fiberglass, metal, stucco, wood, masonry, and plaster. Reciprocating saws are often used for plumbing, construction, HVAC alongside various types of electric jobs. The Best corded reciprocating saw suits individuals who need maximum and unstoppable power to handle diverse tasks. Corded saws sport up to fifteen amps of cutting power, the best ones being tough enough to be used constantly throughout the day. These saws need a power supply from either a mains outlet or a generator in order to handle their tasks effectively. 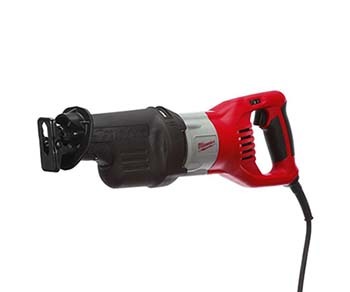 Normally, corded reciprocating saws feature an operating power ranging from 5 to 15 amps. A power range of above 10 suits people who handle heavy-duty jobs, offering more power alongside more strength for absolute efficacy. It’s been noted that corded saws offer limited maneuverability due to their power cords. Nevertheless, they are lighter in terms of weight as they typically don’t incorporate battery pack casings as is the case in the cordless saws. Their light-weight feature enables you to handle varying types of work with ease and convenience. Corded saws feature padded comfort grips that help to shield the user from excessive vibrations when the device is under use. These saws entail the orbital cutting action that affords them improved versatility when it comes to the cuts they craft. Corded reciprocating saws also include the variable speed control that allows you to change the saw’s speed depending on the material you’re cutting. Some saws include a tool-less blade change used to reduce the time spent in switching blades when the saw is in use. Makita JR3070CT Orbital 15 AMP Reciprocating Saw is a saw with plenty of higher-end features that you would expect in its price range of just under $200. This saw is designed to handle the toughest cutting jobs. Makita’s Reciprocating saw is ideal for handling all cutting and demolition work. This Makita JR3070CT does a lot of wonders when cutting wood due to its 15-amp motor. It make your cutting job 45% faster. This reciprocating saw comes with AVT technology as well as a counterbalance system that helps to reduce vibration when cutting to deliver a more efficient cutting power. With the aim of extending the life of the motor and gear assembly, a blade clutch disconnects those components should the blade bind. This also increases user safety. It comes with a four way blade positioning that enables the professional to make a flat and a close cut in places. This Milwaukee Super Sawzall Reciprocating Saw has proven itself time and again that it is one of the powerful saw currently available in the market. Milwaukee 6538-21 reciprocating saw model comes with the best controls available today. Its 15.0 Amp motor offers the highest overload protection in the industry. This reciprocating saw blade features a counter balanced mechanism, which enables it to reduce vibration and allows the unit to run smoothly. This mechanism will help you to balance the tool well when performing your cutting materials. It should be pretty noticeable that no cordless reciprocating saw will ever match the power of this 15.0 Amp Super Sawzall Reciprocating Saw. Buy Milwaukee 6538-21 15.0 Amp Super Sawzall Reciprocating Saw On Amazon! DEWALT DWE304 10 Amp Reciprocating Saw is considered very powerful, because it is fitted with 10.0 amps motor. Dewalt DWE304 10-Amp Reciprocating saw not only provides up to 2,800 strokes per minute, but the 4-position blade clamp. These features give you versatility to turn the blade to cut in unique circumstances without having you twist yourself into uncomfortable positions. Its weight is good; the implication is that you will not find it hard to use it because of weight. 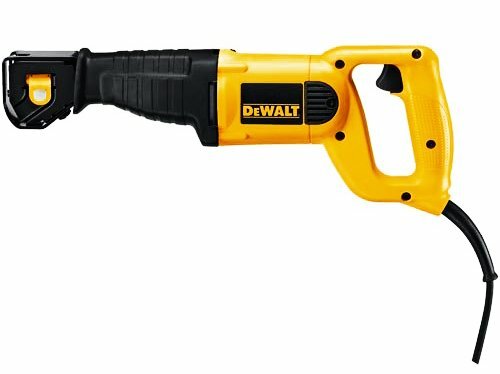 Buy DEWALT DWE304 10-Amp Reciprocating Saw On Amazon! Bosch RS7 1-1/8-inch 11 Amp Reciprocating saw is powerful reciprocating saw that got a large of positive feedback from customer. The Bosch RS7 is capable of providing you with stable smooth power, along exceptional control. Bosch RS7 1-1/8-inch 11 Amp Reciprocating saw is a lightweight and compact allowing you to make accurate cuts in any material that you are cutting through. Its impressive lightweight saw with enough power is capable for heavier-duty jobs cutting through drywall, plywood, plumbing pipes, cement backing board, metal and more. The tool comes with a soft and ergonomic handle that ensure that you have maximum comfort when using the tool. The soft grip will reduce the vibration thus making you to use the tool for a longer time without getting tired. The ergonomic handle also offer strong grip for comfort and safety. Buy Bosch RS7 1-1/8-Inch 11 Amp Reciprocating Saw On Amazon! Hitachi CR13VBY 12A reciprocating saw has all the advanced features, power and cutting ability you would expect from a top-range saw. 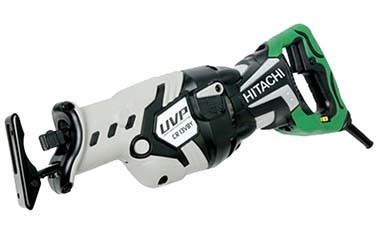 The reciprocating saw from Hitachi features groundbreaking UVP technology. This technology absorbs lots of shocks and impacts and also reduces vibration by more than 65%. Causes of your hands shaking or trembling when using the tools are minimal and the handling also improves. The double molded plastic and elastomer protects the tool from accidental slippage as well as heat. On the other hand the triple seal design shields it against dirt, moisture and other debris. The Hitachi CR13VBY is right at home in the focus of the toughest demolition jobs as well as in situations where expertise precision is required. Buy Hitachi CR13VBY 12-Amp Reciprocating Saw On Amazon! The best corded reciprocating saw is a tool that suits your needs as far as creating cuts for demolition and building materials is concerned. The best corded saws stand out from the crowd, considering the fact that they are built for professional performance. The following buyer’s guide helps you in finding the right saw that suits your specific demands and requirements. Before you buy a corded saw, you first have to decide on how much tool movement you need alongside the accessibility of power outlets. Additionally, you’re advised to assess the size of the unit, its weight, and the length of time the tool will operate. In a rather layman’s language; comparing convenience against the tool’s power capabilities is the key. Since most jobs that need a reciprocating saw require numerous hours of continuous work, your tool should be absolutely comfortable to utilize. Sometimes you may be working your tool overhead, which can result in fatigue due to working at an upward position for an extended period of time. For those who frequently work with their saw overhead, it would be prudent to opt for a corded unit that’s somewhat lighter in construction. A cordless unit boasts a battery that makes it heavier in terms of weight. A smaller tool with enhanced maneuverability is best for compact spaces. Moreover, you may want to opt for a rotating blade in addition to an adjustable blade and handle. These are crucial features that ensure that you get a pretty saw with a natural grip that handles a variety of angles. All corded saw enthusiasts are encouraged to choose a saw with a balanced design. A well-balanced design saw gives you more control while making it feel a little bit lighter when in use. Corded saws that comprise a cushioned grip will make sure that you get absolute comfort at all times, helping you handle long, sweaty tasks with outright ease and convenience. Apparently, power tools that vibrate may increase fatigue. For this reason, you should opt for a unit with a reduced vibration feature to help you work longer and finish your job more quickly. You will also realize that the less vibration feature increases the tool’s accuracy and precision. 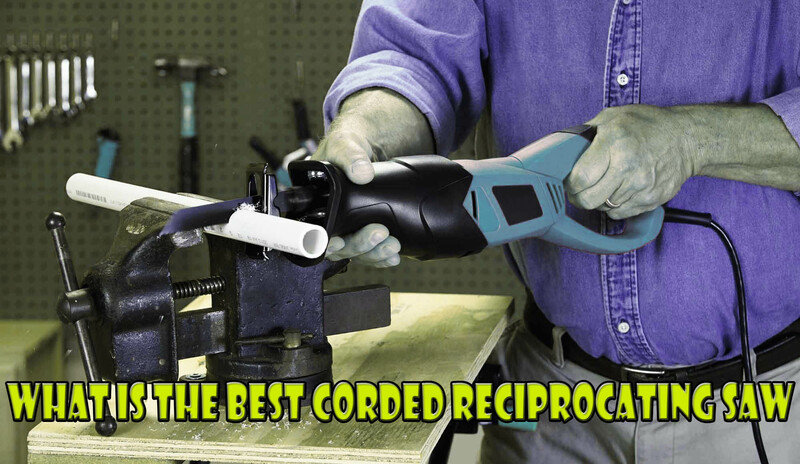 A corded reciprocating saw is an indispensable tool that lets you handle various types of miscellaneous jobs. For a perfect tool there is, you’re advised to opt for the tools that customers agree are the very best. Choose the Best corded reciprocating saw that’s superior when it comes to durability and precision. This buyer’s guide helps you find the right saw that suits your specific needs and requirements.